Preheat the oven to 325 degrees F (165 degrees C). Grease a 1 1/2 quart or larger casserole dish with butter or nonstick spray. Layer half of the potato slices in the bottom of the casserole dish. Dot with half of the butter cut or pinched into small pieces. Arrange half of the garlic slices over the potatoes, then pour half of the heavy cream over. Sprinkle one cup of Cheddar cheese over the layer, and season with salt and pepper. 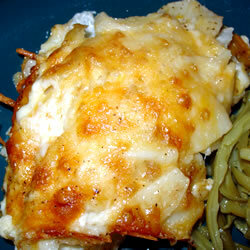 Repeat layering of potatoes, garlic, cream and Cheddar cheese, then top with the slices of provolone cheese. Season again with salt and pepper. Bake for 1/2 hour in the preheated oven, then sprinkle the Parmesan or Romano cheese over the top. This will create a semi-hard cheese crust. Continue baking uncovered for another 30 minutes, or until potatoes are tender when tested with a fork. –Allrecipes favorite.